CNC MACHINED !! HELD TO CLOSE TOLERANCES !! GUARANTEED QUALITY!! 100% U.S MADE GRADE 8 QUALITY !!!! 150,000psi TENSILE STRENTH!! 10MM x 1.25MM x 35MM Long ZINC PLATED WILL NOT RUST!! These are 4 new Rear wheel hub studs for the following ATVs: Suzuki LTZ400 03-13, Kawasaki KFX400 03-06 & the Arctic Cat DVX400 all years. They are the front studs for the LTR450 only. If buying these studs for the front of any of the 400 models please measure your splined area on your old stud & see if it is .481" or 12.21mm . If it is these are the correct studs for your ATV. 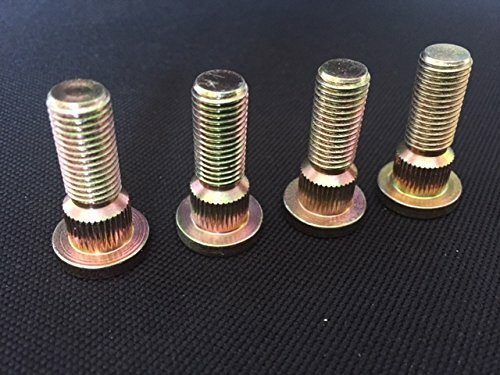 If your splined area is .421" or 10.67mm then we have a different listing for your wheel stud. The manufacturer changed the front stud size from year to year. I have the LTR450 rear stud in a different listing on ebay. This listing is for the .481/12.21mm splined area studs.